A trip to India with a side of Iceland? 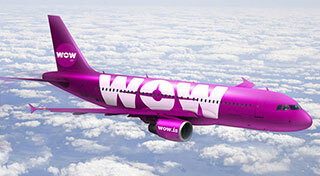 That will soon be an option for Canadians as Icelandic LCC WOW air launches a new route from KEF to DEL starting 6DEC. Travellers from Toronto and Montreal – WW’s Canadian destinations – can now book with one-way trips starting as low as $299 CAD and WOW premium starting at $899 CAD. The airline says the new route will let Canadians explore India at an affordable price, while having the chance to enjoy a stopover in Reykjavik. The onward KEF-DEL leg is about 10.5 hours in flying time. "We are very excited to count New Delhi among our list of growing destinations outside of Europe," said Skúli Mogensen, CEO and founder of WOW air. "This addition expands on WOW air's promise to connect more travellers to as many diverse and exciting cities at the best-possible prices." And talk about a contrast: Delhi is the Indian metropolis that includes New Delhi, the nation’s capital. The city alone has a population of 21.75 million people -- 65 times the population of the entire country of Iceland.